This Miele SF-H HEPA filter is for the S140 – S168 Stick vacuums (previously known as Mini-uprights and Universal uprights). HEPA stands for “High-Efficiency Particulate Air”. In consumer terms, this filter is the latest in the Miele filtration technology for the removal of tiny, lung-damaging particles (including dust mite, feces, and pollen). It also uses the same Generally Activated Charcoal (GAC) that the Active Air Clean filter uses to absorb odors. This Miele filter conforms to the new stringent European standard for filtration (EN 1822) which means that it actually traps 99.99% of all particles as tiny as 0.3 of a micron. What that means is that with this filter, you are greatly improving the air quality of your home and preventing illness that comes from inhaling things you shouldn’t. The Miele HEPA filter is a must for asthma and allergy sufferers. You only have to replace these filters after 50 hours of use or approximately 12 months. There is a place right on the filter itself where you can write the date so you don’t forget when it should be replaced. Some Miele vacuums do not come with the HEPA filter but if you would like to upgrade to this better filter, you certainly can do so. 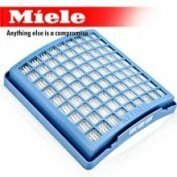 Improve the air quality of your home by ordering today one of these HEPA filters for your Miele S140 – S168 stick vacuum.